The problem of shape is one of the hardest topics of design. Choosing a shape, often means to choose a strategy, a cultural context, even a building technology. Despite of its recall to the primitive hut, triangular shape was almost ignored by both Classic than Modern Masters. We imagined the project site as a contemporary village, a place where inhabitants could feel themselves as part of a community without give up the bound with the natural landscape. A pathway opened into the woods. Fifteen lines of A-frame structures run from Linnanmaa Campus to Kaijonharju centre. The hard sloping roof protects four floors of housing and all the pedestrian and bike paths that run on the public groundfloors. 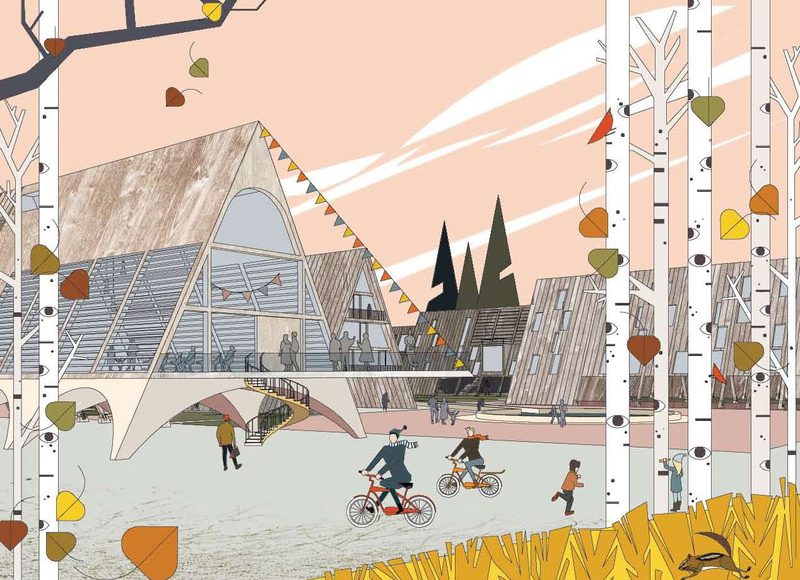 The masterplan is characterized by new type of multifunctional blocks, containing productive spaces, collective spaces and many different type of houses, inspired by the modern A-frame houses by Rudolph Schindler and Andrew Geller. Public spaces move into the blocks groundfloor, allowing a confortable use in every season. Outside the buildings, the public space is freed for natural landscape. 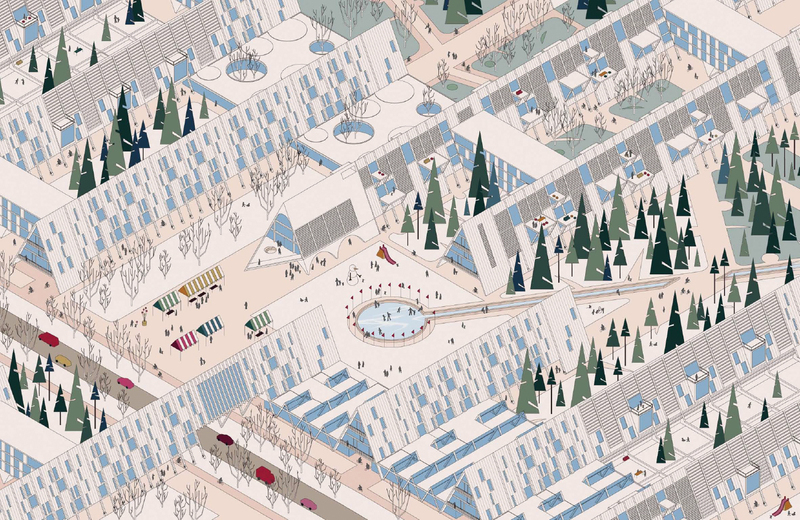 The new village generates a new centre: the masterplan maintains the two main axes of the site, and all the new productive spaces and services are connected with them. The new centre of gravity is pointed out by the new Civic Centre construction. A wide green corridor is preserved, a natural “passage” between the two lakes. From this spine, a lot of trasversal linear woods cross the site. A clear traffic scheme: a vehicular ring around the site, with large parking areas, and a car-free core of the neighbourhood, where a net of covered walkways/bikeways makes stronger the link between the University Campus and Kaijonharju, also in winter.